Rotor Bike Components produce an array of products to aid every level of cyclist get the most out of every pedal stroke. 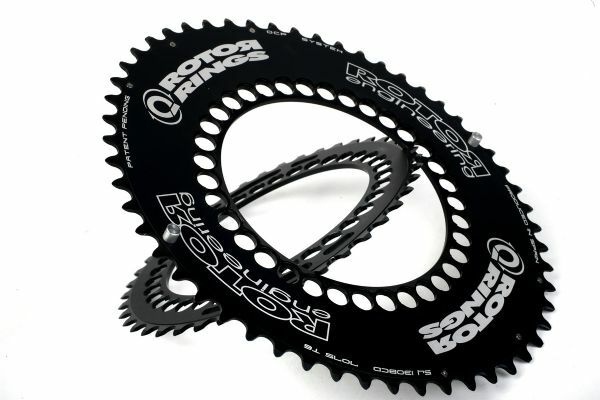 Whether it is for road bike, mountain bike or all the way to triathlon and pro level riders, Rotor Q-Rings, Cranks and Bottom Brackets assist the rider to achieve their performance peak. The first cranks to have been designed with the input of a pro cycling team. This innovative product was developed collaboratively with Cervélo’s engineers, TestTeam riders and the TestTeam’s mechanic staff. The result is the 3D Crank – extremely stiff, to meet the high demands of Thor Hushovd and the TestTeam’s sprinters, yet lightweight enough to satisfy the needs of Carlos Sastre and the climbers on the team. Utilizing a special manufacturing process, named the ‘Trinity Drilling System’, an extruded aluminum bar is intricately CNC machined with three drilled holes through the length of the crank. The result is a unique triple hollow crank arm that enables ROTOR’s engineers to remove the excess aluminum in the core while still maintaining the structural strength of the crank. With this new system ROTOR has significantly improved the Hollowminum technology they developed for their Agilis Evo cranks. 3D crank has evolved the Agilis Evo design in fixing the axle to the right crank. The left crank is now used to assemble or disassemble the crankset with a low torque axle end bolt and the new DTT Evo clamping bolt. The opposite paired bolt system (the most common in the market) is no longer needed. Instead, an oversized DTT Evo bolt distributes the load forces along the thread. Installation is completely conventional but with improvements in both the efficiency and stiffness of the axle-crank interface. In order to avoid overtightening, ROTOR 3D cranks include a replaceable threaded bushing between the crank and the bolt. In case of bolt failure due to overtightening, the crank is not affected and is easily repaired. 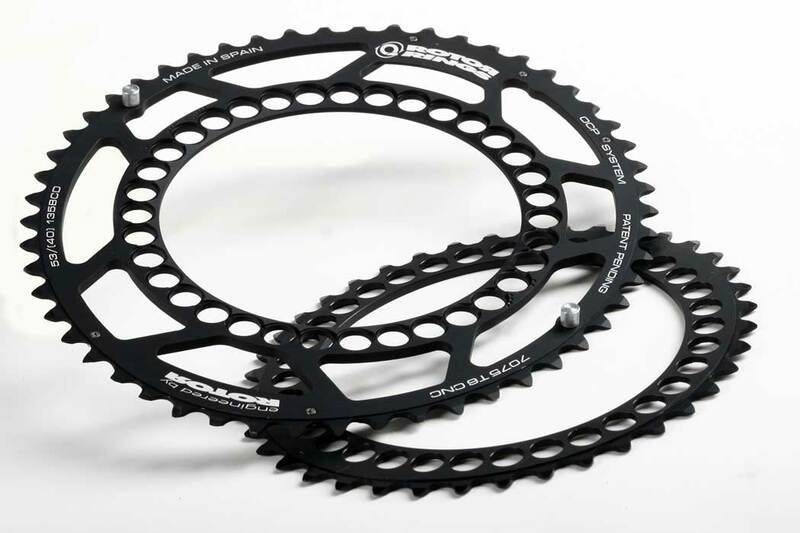 QRings increase your power by emulating a Rotor System crankset in the power stroke and by minimizing the intensity of the ‘dead spot’ zones. By extending the time you spend in the power stroke (where 90% of all power is produced) and smoothly accelerating the legs through the critically weak ‘dead spots’, simultaneously magnifying the feeble pedal input in these zones, Q’s give that extra advantage you need to get ahead. Rotor’s QRings are designed with smooth diameter variations, which magnify the benefits of a smooth spin by reducing variations in: power production, rotational inertia of the cyclist legs, and directional inertia of the cyclist’s body and bike. For the vast majority of cyclist’s power is produced in the down stroke of the pedal cycle, irrespective of pedaling technique. By installing QRings, the cyclist’s power production is smoothed out, making a fluid spin more natural. The thing that makes Q’s even better, is that the biomechanically inspired diameter variation results in more power output and less lactates giving a genuinely free increase in endurance and power. Orientation and adjustability is key. The shape and ovalization of QRings isn’t everything: what really sets them apart, is the basic orientation and the possibility to adjust it. The problem with normal ovalised chainrings is that they only work in one set position on a bike. As soon as the cyclist’s hip moves, the angle of the crank at the minimum and maximum power points changes, which in turn changes the orientation of the chainring in regards to the cassette. The key was to make Q’s compensate for the effects of varying riding positions, leg inertia and bike inertia. The basic orientation of QRings, based on power and inertia studies, is one of the reasons QRings feel so natural. The revolutionary narrow variance OCP (Optimum Chainring Position) system gives the cyclist the possibility to choose from an array of settings within the small, crucial range of useful orientations. Why? Because everyone has a different riding style, a different bike setup and a different pedaling style. The OCP system guarantees you personal optimization of the chainrings to make them work best for you, with your riding style, your bike and the terrain you’re dealing with.